The RPG dice games (rpg = role playing game) on this page combine easy to learn instructions with a fun playing experience. You can practice "Cookie Fu" or brawl in a bar without feeling sore the next day. The enticing combination appeals to players who shy away from intense dungeons and dragons dice or role playing games. Like any role playing game, these involve characters who possess different skills and abilities. The cards or rpg dice in these games will dictate what each character can and cannot do. During the game, your challenge is to find a way to use your character's strengths to win. The granddaddy of all role playing games, D&D features character creation, strategy and adventure! It is never too late to learn this great RPG dice game. The Dungeons and Dragons Starter Set delivers a fun, easy way for new players to learn the basics. Careful! You may find yourself with a new favorite game. Inn Fighting by Wizards of the Coast combines 52 cards, 6 custom dice and 1 D20 die into a pugilist's paradise. To come out a winner in this bar brawl, you'll need to collect the most victory points. The custom dice roll can result in Fists, Chairs, Power, Ale, or Luck. Meanwhile, the Defense dice determines whether you land the hit at all or get knocked for a loop instead. Ideal for 3-6 players ages 12 and up, you can read up on strategy tips and tactics from the game's own designer. When you're ready to fight (I mean play), you can find the Inn-Fighting dice game at Uncle's Games. Roll the dice well and you're off to a good start in your quest to gain the King's favor (and don't forget about the Queen). Your dice rolls will help (or hurt) your chances of picking up useful character cards. The first player to roll 7 of a kind will receive his Majesty's support and, possibly, a win. Rio Grande Games manufactures the English version of this German game. You can download the complete game rules for free. To Court the King will be enjoyed by fans of political intrigue, medieval times or compelling dice/card games. The popularity of the Settlers of Catan board game has led to a new Settlers of Catan RPG Dice Game. The recently released deluxe version incorporates more strategy in the game than the basic version. It works as a good introduction to the world of Catan. Each game can be completed in 15-30 minutes. You'll roll 6 colorful custom dice. These rpg dice are imprinted with the different resource symbols, common to Catan games: Road building, settlements, cities and hiring knights. Record your progress on your building sheet (score sheet). The game can be played solo or with up to 4 people. 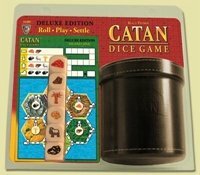 You can even play a free online version of this role playing dice game along with other Catan games. So, go forth and discover, explore and settle the world of Catan! Cookie Fu: Fortune Cookie Fighter! With amusing names like "Sweet Flaky Kick or the Devastating Hurl of Crumbled Fate", Cookie Fu delivers a fun, customizable rpg dice game. Your goal is to "defeat your opponents, crush their cookies" by rolling your colorful "learned fu", "common fu" and fortune die. 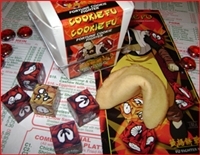 To play, each player needs a Cookie Fu Retail Starter Set by Blue Kabuto. You can also buy actual, edible fortune cookies called Clan Cookies which contain never before seen Cookie Fu moves to use in your battles. So, you get a tasty snack that packs a punch!